Bradevelt. The name popped into my mind, unbidden, while I was shoveling snow. This is unusual, because I usually spend my time inventing new curse words while I am shoveling snow. In New Jersey in general, but certainly on the Jersey Shore, place names have some unique history. From what I understand, at one time my native Monmouth County consisted of three Townships: Middletown Township to the north, still the largest municipality in the county, Freehold Township to the west, and Shrewsbury Township to the south. Shrewsbury Township was originally 1,000 square miles, stretching from the Navesink River southward, including all of southern Monmouth County and present-day Ocean County. Shrewsbury Township is now a modest sized co-op and apartment complex on 0.11 square miles with a population just shy of 1,200 souls. Weird. Situated in these large townships were scattered villages that were typically named after a prominent (or dominant) family in the area, although American Indian names were also adopted. There are dozens of named villages, some of which became incorporated Boroughs, some of which faded into obscurity. Bradevelt is a section of Marlboro Township. So is Robertsville, Morganville, Wickatunk, Spring Valley, Claytons Corner, Herbert’s Corner, Hillsdale and Vanderberg. Of these names, only two – Morganville and Wickatunk – are still used in common parlance, primarily because these names are associated with zip codes. Zip codes have a specific geography, so they help establish a physical “place”. Most of the other names are names of intersections, so it would be difficult to say that you live in Robertsville unless you live at the intersection of Robertsville Road and Tennent Road. New York City, with its mapped neighborhoods, does this so much better. Some towns, long closely associated with other towns (for good or ill), decided to take unique names. Matawan Township became Aberdeen Township, adding a Scottish flavor. South Belmar became Lake Como – a bit of Italian flair. Dover Township in Ocean County became Toms River, which is good, because no one ever used the name Dover Township, except the people who live in Dover Township in Morris County. By the way, bravo for Robbinsville, who reduced the number of Washington Townships from six to five. What is really unique, though, is that certain names only exist in the mind of signmakers and cartographers. Biblical Siloam exists as an exit on Interstate 195, but not, to the best of my knowledge, in the minds of anyone living in this section of modern-day Freehold Township. Also in a biblical vein, Galilee, a portion of northern Monmouth Beach, exists only in mind of the makers of Hagstrom Maps. My 82 year old neighbor, who grew up in tiny Monmouth Beach, never heard anyone refer to Galilee. Oh, and the same county road can have a half-dozen names. 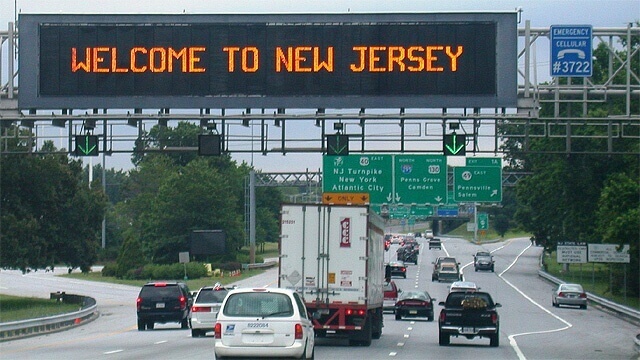 And in New Jersey you have to turn right to turn left. Sure it’s crazy, but it’s our crazy.